SH: Welcome to the Future Cloud seems to be very supportive of intellectual property (IP) rights and digital rights managements (DRM). Are IP and DRM necessary to the development of a healthy future? On the other hand, more and more, we do not need control over our creations and we do not need IP protection, because we let go — voluntarily. We find other ways to earn money. Think of the startup musician who gives away his music for free in order to get his fans to visit a live concert. The point is, in the future cloud, we need to have the choice. The choice to trade privacy for services, the choice to sell privacy for money, the choice to buy your privacy. The choice to control or to let go. For that , we need this personal dashboard. Without it, the Cloud is a new disaster. Control over our virtual life wasn’t that important in the past. Until now, virtual life was more of a toy thing. In the next few years, virtual identity is becoming a life vest. Therefore, it is getting more and more important that we actually own our identities and our data. Right now, we do not own them. Google and Facebook do, plus all the company sites we are subscribed to. We must change this, or the future will turn into a privacy nightmare. The dashboard turns the world upside down. It creates a bridge between any organization and you. You grant companies access to your dashboard and you control what they do with your data. Not the other way around, as is now. From the hundreds of “myvodafone” and “mygovernment” and so on into the single “mydashboard”. 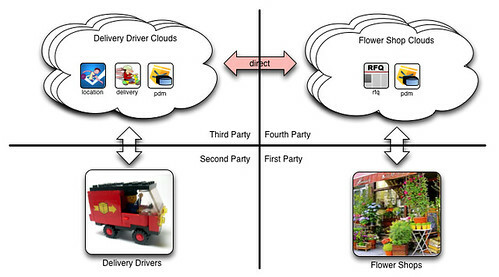 In the preceding diagram, there isn’t one event system that manages the interactions between the shops and the drivers. Rather, each driver has their own personal event network, each shop has their own personal event network, and the guild has one too. The interactions aren’t simply events raised within a single event network, but rather events raised between the networks of each participant. I’ve shown some of the apps that drivers, shops, and the guilds have installed on their personal event networks, but they would each be individually managed and configured. In fact, it’s reasonable to assume that different drivers or shops might use different apps for the same purpose as long as they understood the events. 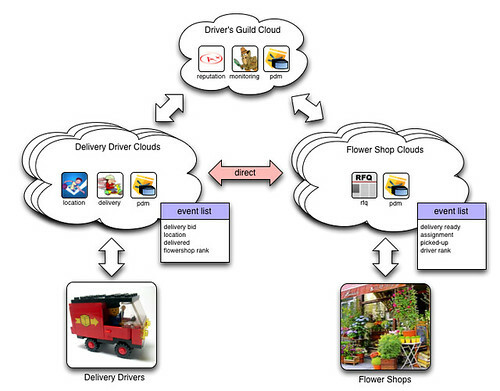 Together with our ideas about how notification occurs and how personal data can be managed in personal event networks, event subscription creates a powerful system for enabling a completely new kind of interaction between vendors and customers (note that in this example, the flowershop is the customer who is negotiating for and buying delivery services from the drivers). SH: Which technology (or branch of science) do you feel will have the biggest impact in the next fifteen years? Who do you see as the leader in the development of that technology? MB: My pick: a small startup called Qyi.com. It is the closest thing to my vision of a personal dashboard that I have discovered so far. I met the owner, Marcel van Galen, and he convinced me that in his business model the individual owner will stay in control. This will sweep aside the Google and Facebook attitude of “company owning”. It is vital, by the way, that neither Google nor Facebook will ever buy Qyi. That is a major threat to innovation in general: big companies buying startups. It is the surest way to kill them. It makes the startup owner a millionaire and humanity a beggar. I am sure “Qyi” is a typo, and that Marcel means Qiy, which is indeed cool. Check ’em out. I can parse some of that, but mostly I don’t want to deal with any of it. In any case, my trying to make a comment with the help of a Facebook ID was a fail. This kind of minor ordeal (the comment gauntlet, even if one succeeds with it) is just one bit of evidence for how lame the commercial Web still is (on the whole — not blaming SingularityHub alone here), how much we remain stuck in the calf-cow world of client-server, and why we will remain stuck until making comments is as simple as creating an event that we control and other autonomous peers respect in a useful way. In any case, that future is not far off. We’re making it today. Qiy seems interesting. Hope it is more than brochure wear….The voice and tone of the site seemed to be very Corp…. I have been attempting to solve many of the issues around developing simple user friendly VRM based apps for a number of years. Along the way there have been many learning experiences as we live in a world were most of our reality is upside down…by this I mean that “Communities” despite their proven ability to add value and billions in revenues are relegated to the status of commodities who’s data/cotent can be regularly and repeatedly sold to the highest bidder. To begin to understand the minmum steps to develop “Community” first “VRM” like applications I had to un learn deeply imprinted notions around corporations, supply chains and business models. Once I began this process it was very much like waking up from a dream. Cool! This is how the web works: connecting previously unknown people and minds… Very interesting to see this connection between my vision of the future cloud and such notions as the VRM project of Doc Searls & the personal event cloud of Phil Windley. Really cool and, in my eyes, absolutely “futurechecked”. -about my vision of a Cloud Seal, a protection layer that everyone can easily wrap around their own knowledge sources. In what span of time you think it is feasible?, in 1 or in 10 years? What existing parties would have to cooperate? -the Personal Dashboard is based on the existence of Cloud Seals; this gives us a safe digital haven. I guess Qiy (typo in interview indeed, correct is: http://www.qiy.com) could become this Personal Dashboard, but do you know of any other promising initiatives? Thanks, Marcel. Good to meet you. I’ll answer your questions and post the comment ASAP. Meanwhile I’m about to board a series of planes for long flights. But I’ll get on it as soon as I can. I really agree with the ‘Personal Dashboard’ concept. It’s a great way to bring privacy back under the control of the user and really understand/track what information is being shared in return for ‘free’ services. With regards to the time span question (I hope you don’t mind me cutting in), I feel that two things need to happen in order for there to be a fundamental shift in people’s mindsets towards restricting what personal information is available on the web and moving over to a service like Cloud Seal. 1. A real threat or actual experience that encourages the user to ‘rethink’ their current acceptance to share information online. Credit card fraud and identity theft are good examples but now almost accepted as ‘part of the danger’ of shopping online. 2. Cloud Seal needs to encompass payment. In my opinion it’s possibly 4-5 years away. Have you considered the payment side of Cloud Seal? Would this be an option?